The world's first mouse and keyboard built specifically for Xbox... but is it any good? A well built, comfortable, high end mechanical keyboard and gaming mouse built specifically to pair with your console, at a premium price. Razer has really stepped up its peripheral game in the last few years, producing excellent units with proprietary switches, suites of useful features, and an increased emphasis on durability (an area where it fell a bit short in some previous hardware). That increased focus on quality is evident in the Turret, the world's first keyboard and mouse combination designed specifically with the Xbox One in mind (though it's also fully PC compatible). Since mouse and keyboard support on Xbox One was announced last year, a number of peripheral manufacturers have begun including 'Xbox compatible' marketing information on their packaging, but the Turret is the first mouse/keyboard pair designed from the ground up for Xbox One connectivity. The high end gaming keyboard and mouse that are the core of the Turret package are modeled after two of the peripherals in our best gaming keyboard and best gaming mouse roundups, a tenkeyless version of the BlackWidow keyboard and a modified version of the Mamba mouse. The keyboard is built around Razer's excellent proprietary Green switches, which are clicky and tactile - great for gaming. Unsurprisingly, they perform as well in the Turret model as they do in Razer's other gaming keyboard offerings. They're extremely responsive and, if you do much text chatting or are going to use the Turret with your PC, fantastic to type on as well. The mouse is an excellent wireless unit, exhibiting no perceptible lag and high sensitivity (it packs a 16,000 CPI optical sensor), and both the keyboard and mouse pair to your Xbox One through a single wireless 2.4 GHz dongle. The mouse and keyboard can be turned on and off independently, a nice touch if you're just using the keyboard to navigate menus. The Turret is unlikely to completely displace your controller for navigation, however, as I was unable to toggle through some sub-menus with the arrow keys on the keyboard (and at the dashboard level there's virtually no mouse support whatsoever, at least for now). I couldn't, for instance, switch between wired and wireless internet connection options, despite all the surface menu levels being totally navigable with the keyboard. In-game, Warframe controlled with the silky smooth precision you expect from a keyboard and mouse on PC; if you didn't know what platform the Turret was connected to, it would be easy to forget you're playing a console game. The mouse glides around the pad with ease and I never suffered any issues with latency or the sensor losing tracking across several hours of gameplay. Interestingly, Fortnite has already implemented a player split based on what kind of inputs players are using, so controller bound players won't find themselves mercilessly owned by gamers wielding a mouse and keyboard. While only 15 games (so far) support mouse and keyboard play, it'll be interesting to see if other developers follow suit as the library of compatible games expands. The extra height on the raised keycaps works well to showcase the RGB lighting on the deck, and while there is a wrist rest that extends several inches from the base, it's the same unforgiving metal as the rest of the board. While it offers some much needed support, it's not nearly as cozy as some of the plush leatherette offerings that come with a number of modern gaming keyboards. The slide out mouse pad is excellent, on the other hand, offering just enough space to move the mouse around comfortably while not tilting way over the edge of your lap. The sturdy metal chassis of the keyboard is solid and surprisingly heavy, which may seem like a con at first blush but actually helps when you've got it balanced across your lap. It certainly feels designed to take some punishment or, in a pinch in the midst of a zombie apocalypse, deal some out when wielded like a bludgeon. If the board does slide off to one side, it comes with a set of built in magnets that ensure the mouse won't go flying off to crash into your coffee table or tumble down on your living room floor. While the keyboard is tenkeyless and lacks PC oriented features like macro keys or dedicated media controls, the mouse is as fully featured as its PC counterpart. It's lightweight for a wireless mouse, with a pair of thumb buttons and CPI buttons, and it fits the hand comfortably and utilizes Razer's top notch switches. It's even got a slot in the bottom where the wireless dongle can be stashed when not in use. 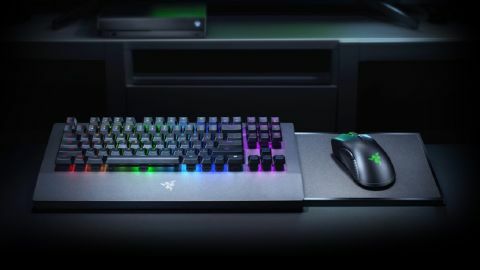 Razer promises up to 40 hours of use on one charge for both peripherals, and I certainly never got close to depleting the battery across several long sessions of use, first on the office Xbox One and then paired with my PC. There's also a handy, dedicated Xbox One button in place of right Ctrl, which saves you having to scrounge up and power on a controller every time you want to jump back to the dashboard. The Turret's not a cheap proposition, retailing for $249.99 (it's currently available for preorder on the Microsoft Store and should ship today or tomorrow), but you'd pay roughly the same for an excellent mechanical gaming keyboard and mouse. It's an amazing package for anyone looking to play console games with a keyboard and mouse, with some thoughtful features designed specifically for use in the living room on a big screen TV. It's a touch expensive if you're buying it exclusively to play the occasional console game, but if you're also going to use it in conjunction with your main PC (or for laptop play at home), it's a solid value peripheral that's very thoughtfully designed and built.